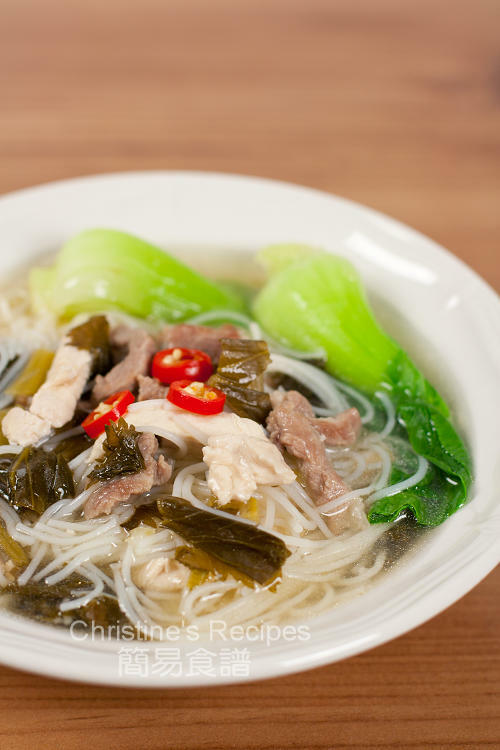 If you have traveled to or lived in Hong Kong for a while, you must have known this popular Shredded Pork with Salted Vegetables Rice Noodle Soup (雪菜肉絲湯米粉). 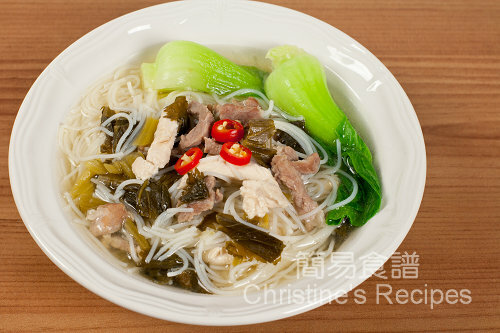 The salted vegetables used in this noodle soup is called “雪菜/雪裡紅” (xue cai in Chinese), a kind of pickled greens made from mustard. It goes fantastic well with pork, usually cooked in soup, sometimes stir-fried. This time I also added some shredded chicken to increase more proteins and textures, as well as cleared away the leftovers in my fridge. This dish is my family’s favourite, quick lunch throughout the year. Follow the instructions of the packet, blanch rice noodles in boiling water until softens. Rinse with cold water to remove the starch outside, then drain well. Set aside. Soak salted vegetables in water with 1/2 teaspoon of salt dissolved, for 20 minutes. Rinse for a few times. Press all the excess water out from the vegetables. Cut into smaller pieces. Wash baby bok choy and cut into halves lengthwise. Mix pork and chicken with marinade for 15 minutes. In a large saucepan, bring chicken stock and water to a boil. Add salted vegetables, pork and chicken. When it boils again, add rice noodles. Again it boils, add baby bok choy lastly because you don’t want to overcook them and keep them freshly green. Season with salt and sesame oil. Sprinkle red chili if desired. Serve hot. That looks REALLY good. I love the red chili on top. Makes the soup POP. Must be quite similar to 雪菜肉絲面...delicious. thank you for this recipe and all the others that you are posting. it is helping me to learn and relive all the chinese food that my mum cooks for me. and now that i am getting married and managing a house of my own, your website is an invaluable resource. The recipe of stir-fried glutinous rice has been translated. Thank you - I love your recipes. I've made 4 Japanese Cheesecakes this weekend! Just wondering what is the purpose of soaking the salted vegetables in salted water for 20 minutes? Also while you are here, do you use the Plain Cake Flour or Self-Raising Cake Flour in your cheesecake? Also I'm having trouble melting the cream cheese even though I've left it to get to room temperature for at least 6 hours. Would you mind telling me how long it usually takes you to melt your cream cheese? Mine was at least 30 minutes and there was still lumps and I felt that the milk was all evaporating? Many thanks if you could help. By soaking the salted vegetables in salted water, it'll help to decrease the saltiness and remove any chemical impurities if there are any. For making my Japanese cheesecake, I often use plain cake flour as the beaten egg whites are acting as good raising agent and will make the cake soft enough. Yeah, it's quite challenging to melt cream cheese, needs a little bit more patience. If you have a balloon whisk, that'd help a lot. Place the bowl of your cream cheese over warm water to speed up the melting process. 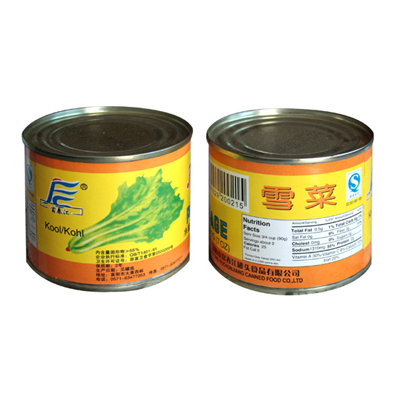 can you tell me what is Salted Vegetables in Chinese or a picture of the can? The salted vegetables used in this recipe is called 雪菜.